Owner and chef Ben Elliott serves locally sourced food — including from the farm built by his grandparents in the 1940s. IN THE KITCHEN Owner and chef Ben Elliott, who previously worked at No. 9 Park in Boston under Barbara Lynch, spent time in his youth at Saltbox Farm, which his grandparents, Edward and Emily Thomas, built in the 1940s. “I really absorbed a lot of my love of agriculture from my grandfather, and my grandmother was a wonderful cook,” Elliott said. 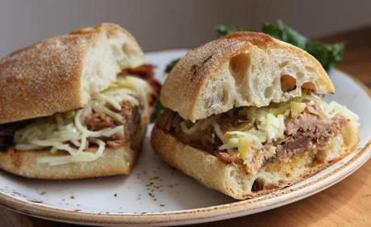 A roasted pork sandwich at Saltbox Kitchen. 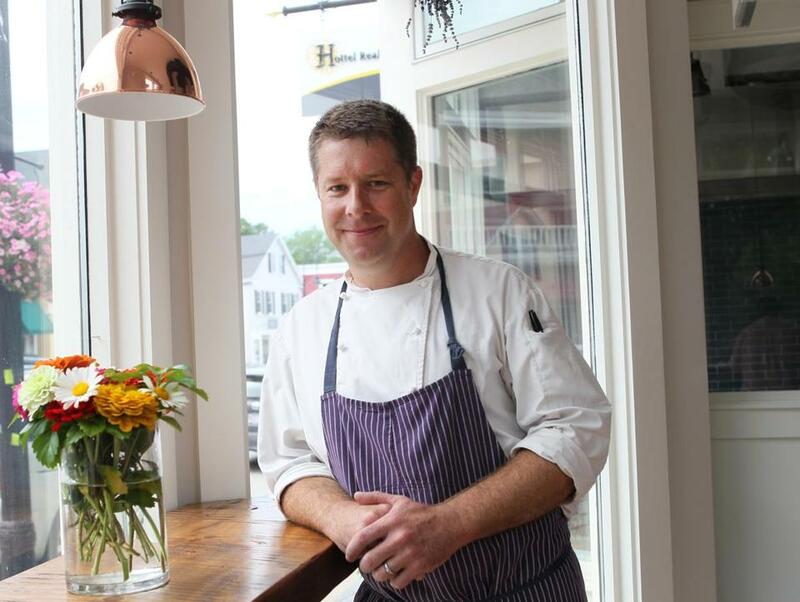 About seven years ago, he began the process of bringing the family farm on Westford Road “back to life,” and eventually moved into private chef and catering work. A Concord resident, he yearned to establish a platform for sharing the farm’s work with the community. In July, he launched Saltbox Kitchen alongside chef de cuisine Aran Goldstein, who attended the New England Culinary School and has cooked around the world, including in Portugal, Italy, and China. THE LOCALE The restaurant is on Commonwealth Avenue in West Concord. Floor-to-ceiling windows cast plenty of light across the hardwood floors. Flower vases are perched atop a scattering of country-rustic wood tables. Orders are placed at a counter to the left; toward the back, stools are lined up overlooking an expansive open kitchen. The burrata cheese ($14), which hails from the Mozzarella House in Peabody, is as likely as any menu item to be a standard, Goldstein said. The outer mozzarella shell gives way to an interior made from stretched mozzarella curds and heavy cream; it’s buttery and utterly dreamy. The accompanying caponata from the farm varies: On our visit, the oval ball of burrata, drizzled with olive oil and lemon juice, nested on a bright bed of apricots, golden raisins, basil, chives, halved cherry tomatoes, and cracked black pepper, with a` slice of grilled bread as a welcome base for the spread. The pernil sandwich ($12) is roasted pulled pork shoulder layered with a kohlrabi slaw on a baguette, with fiery picked chilies on the side. The Latin-spiced, tender meat is delicious, although fattier on the ends than I prefer, while the slaw provides just the right amount of crunch. Another sandwich to try: braised short rib with caciocavallo cheese and roasted peppers from the farm. Elliott also points with pride to a recent corn bisque with pickled chanterelle mushrooms. Breakfast visitors might find such items as a soft-boiled egg bowl with farro and kale ($7), and savory sourdough toast with goat cheese, country ham, and olive oil ($5). There are also several wines and beers. Prepared foods displayed in a case at the counter vary, but might include grilled eggplant with golden raisins, crumbled feta cheese, pomegranate molasses, and fresh herbs including sumac, parsley, and mint. Elliott said he also appreciates that diners might gravitate toward simple roasted potatoes or grilled steak. “We recognize not everybody wants an experimental dinner every night of the week,” he said. Saltbox Kitchen is at 84 Commonwealth Ave., West Concord; 978-610-6020, www.saltboxfarmconcord.com.